Bollinger Bands indicate relative high and low prices, using this information you can buy relatively low and sell relatively high. 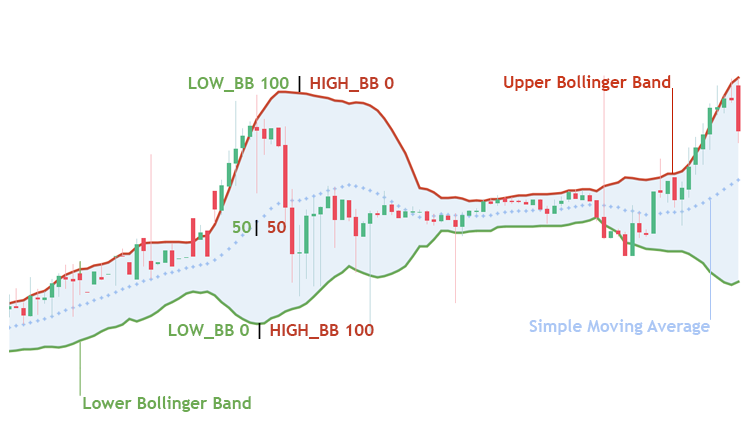 With this strategy you can configure at which percentage from the lower Bollinger Band Gunbot should buy, and at which percentage from the upper Bollinger Band a sell order should be placed. Combined with RSI, Stochastic or MFI, this might be one of the most powerful strategies Gunbot has to offer. You can even combine multiple of these indicators, and run a BB-Stoch-RSI strategy, only buying or selling when multiple indicators show that momentum is about to turn. This strategy is often combined with Stepgain, with bb as the buying strategy, then selling with stepgain. Scenario: buy at LOW_BB 5, sell at HIGH_BB 5. Great for relatively fast scalping, but it can be risky to just rely on Bollinger Bands. In this example, after the last buy prices dropped a lot and you have a bag to worry about. Scenario: buy at LOW_BB 5, sell at HIGH_BB 5. 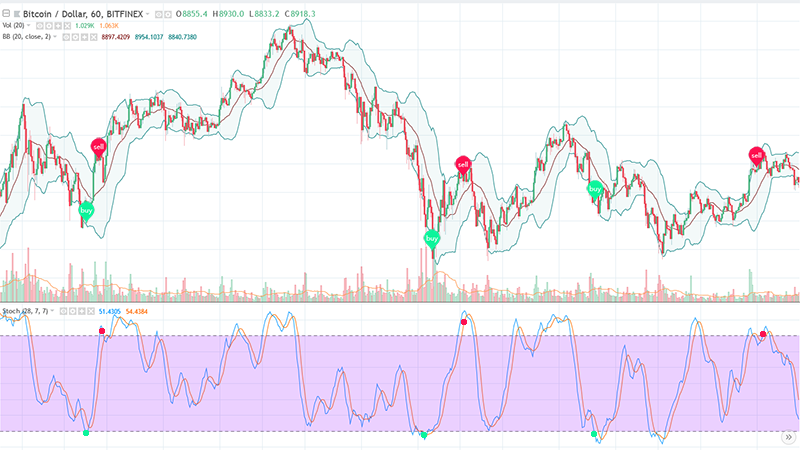 Additionally use STOCH_BUY_LEVEL 20 and STOCH_SELL_LEVEL 80 for confirming oversold/overbought conditions after the Bollinger Bands values have been met. This particular setting traded less often, but managed to find lower lows for buy orders. The gains per trade were bigger and the bot managed to sell each time. These parameters control the execution of buy orders when using bb as buying strategy. BUY_LEVEL 0.1 Values: numerical – represent a percentage. This setting can be used as protection against buying above EMA. The default value of 0.6% will prevent the bot from buying when the price is not at least 0.6 % under the lowest EMA. LOW_BB 45 Values: numerical – represents a percentage. This sets the target for buying with bb as buying strategy. The bot will buy when the price hits a point x% from the lower Bollinger Band. Do not use 0. These parameters control the execution of sell orders when using bb as selling strategy. HIGH_BB 45 Values: numerical – represents a percentage. This sets the target for selling with bb as selling strategy. The bot will sell when the price hits a point x% from the upper Bollinger Band. Do not use 0. GAIN 0.6 Values: numerical – represents a percentage. Used as a safety setting, defining the minimum gain of all your trades. General settings for bb including the relevant indicators for this strategy. These settings have no function in bb and act as placeholders.